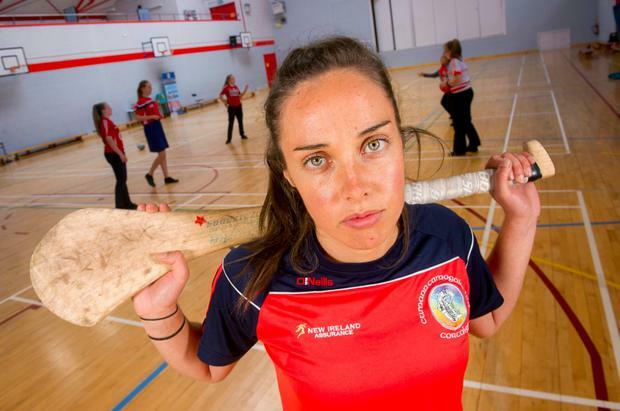 Cork camogie star Julia White is a real-life sporting hero. Fresh from the bench in the sixth minute of injury time in last year's All-Ireland senior final in Croke Park, when the game was deadlocked, she expertly sent over a point to secure the win for her county. In the aftermath, she graced the back pages of newspapers and her name was up in lights. Sports fans wanted to know how she held her nerve with so much at stake. Her feat, and the timing of it, are exactly what dreams are made of it. White teaches in Christ King Secondary School in Cork, a girls' school with close to 900 students. Today she will play again for her county, on the biggest stage, as they try to defend their All-Ireland title against the mighty Kilkenny. Yet her extraordinary achievements last year and the magnitude of today's game resonate with only a small number of her students, as sport doesn't hold the interest of the majority of young girls. White is a hero in their midst and they have no idea. "Most of the girls wouldn't know that I'm playing in a final," says White. "The staff would know and the few girls who play camogie with the club would know, but most of them wouldn't know that I'll be playing in Croke Park or on the TV. They have some idea that I play sport but they wouldn't understand the gravity of an All-Ireland final. "Ireland soccer player Saoirse Noonan was with us, she has just done her Leaving Cert. The staff knew about her achievements but it didn't seem to register with the students. "I don't think it's the school's issue, I just think that unless you are involved in sport, then they wouldn't know about it and that's something that could be worked on; - helping increase the profiles of women who play sport." White teaches PE and loves it, even though it's a struggle to get numbers to participate in class. Recent research carried out by Lidl showed that one in every two girls gives up sport by the age of 13 and this trend is something that the Cork player can most definitely vouch for. "The dropout in sport is pretty shocking and even trying to get the girls to do PE is very hard. You would think in an all-girls school the embarrassment factor wouldn't be there, but so many don't want to do it. In a class of 27 or 28, I could have 10 not participating," she explains. "They would have notes from their parents and they wouldn't have good reasons in them, so when the parents aren't supporting what we are trying to do, it becomes even harder. I send a note back home but there isn't really much I can do. "I think one of the big problems is that we are only seeing the girls once a week, and for a lot of them that could be all the activity they are getting. Watching all the influencers on YouTube, Snapchat and Instagram is what they do. It's a different environment now." The low participation numbers have forced White to think outside the box for her classes and the way she teaches PE. She knows that many of the students shy away from competitive sports so she offers things such as running clubs, dance and yoga as alternatives. White goes on: "It's a big challenge trying to increase participation and I don't know if there is a simple solution. As well as the likes of basketball and tennis, we do dance and gymnastics and HRA (health related activities) - that is learning about fitness. We bring them swimming but again that poses challenges as we could bring 50 swimming and 25 would have notes. "I think any type of activity they want to do we should let them do it for a while anyway just to get them enjoying it. Any time we put on Just Dance from YouTube on a projector they all do it. It might seem like the teacher is taking the easy way out, but every single child will do it and they enjoy it. "I think it's about getting them to enjoy being active without even realising they are doing it. The minute some girls hear sport or PE they turn away. Any of the ball games, just forget about it. When I was in school I would have noticed girls opting out of PE myself but now I feel it's got much worse." While in college, White spent a lot of time looking at body image and did her final year project on the subject. During her teaching practice she surveyed her students, asked them a range of questions about their body image and their ideals. "We did a scrapbook session and they had to cut out their perfect body and it was all big bums and big lips like Kim Kardashian and then at the end of the six weeks we did the scrap session again and there were some normal looking bodies there. I think at the end of it they started to understand that being strong and fit is good but the main thing was understanding that everyone is different and looks different. "Every day we spoke abut how they were feeling at the start of class then we would do activities and at the end of class speak about how they were feeling again. They don't understand healthy, they see what type of body they want and they don't know then what is good for you and what is not. "So we worked on explaining to them about what is healthy. I think they have this idea that if they do sport they will get really muscular - they don't understand. "I've seen young girls go to the gym all the time to try and lose weight, even though they didn't have any to lose. So I was trying to educate them on what was normal and what was healthy." Being surrounded by women and girls who play sport has shown White first-hand the benefits of being active. Her team-mates are fit, healthy and strong and, as a result, they are body confident because they know that their bodies are working and performing at a high level. White has had to overcome some physical challenges of her own. Three bouts of glandular fever since embarking on her inter-county career at 16, a ruptured Achilles in 2015 and a fractured foot last year that kept her out right up until the All-Ireland semi-final. However, the resilience and determination that sport has instilled ensured that the then 26-year-old never stopped battling to get back on the pitch. And when she got the chance in last year's final, White made it count, winning the game for the team and earning her fifth All-Ireland medal. "I was a little annoyed I hadn't been brought on earlier and frustrated," she reveals. "I was full of adrenaline and anger I wanted to do something. I can't really remember but it was in my mind [that] I was going to do something here. It was only two days after that it sunk in. It was nice, the hard work paid off, we won." Fast forward 12 months and Cork are back in Croke Park facing their familiar foes, Kilkenny, who would love nothing more than to knock the reigning champions off their perch, just as Cork did to them last year. "We know each other inside out now," White says of the two sides. "I taught there for two years and I loved it there. I know the Kilkenny team very well, it's an amazing county. I even taught a few of the girls who are on the panel. "It is always very close between us. I'm a little bit worried that we haven't had the biggest tests but I don't think we will know where we are at until we step out there and I'm really looking forward to that. It's what we work hard for all year." Ahead of the All-Ireland semi-final win over Tipperary, Cork were handed a huge boost when Briege Corkery rejoined the panel after having a baby in March. "It's great to have her back," admits White. "A few of us were asked how did we feel about her coming back. We were delighted. We had been asking her to come back before she did, so we had nearly given up hope. She had been working away before that anyway, so she was in good shape. "Briege is coming back to play so that adds to the competition for places. It's a good thing though, she keeps us on our toes. It's a good worry to have going in to an All-Ireland final. There is no complacency and she has 17 All-Ireland medals. "She is so modest and humble and was so conscious of coming in late [that] she spoke to us and thanked us for having her back and accepting and she wants to help in any way. "She is such a competitor. I've never met anyone as competitive as her. Everyone loves her personality so that makes it easier to come back. She came back in decent shape and has been on an upward curve. The baby is at every training session, her two nephews come along and mind him and if we are going for breakfast or anything, he comes too. It's lovely to have him around, it's such a nice touch." On the pitch, White has achieved an incredible amount; she's a natural leader and positive thinker. It's clear that her work off the pitch is just getting started. She's keen to make a difference, to help guide the next generation. No better woman.